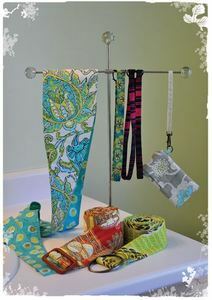 These easy to make accessories are wonderful for yourself or as gifts! Single or double headband in adult and children sizes that can be embellished with bling or buttons. Wide or narrow belt in five sizes to dress up your favorite jeans. Reversible Obi belt in four sizes that wraps around and ties in the front. Cell phone case with front pocket and optional wrist strap that fits most cell/smart phones and can be worn on a belt as well. We used cotton (Rowan Fabrics and Free Spirit Fabrics) and fine cotton corduroy for our models. Wool, denim, linen and bamboo fabrics would also be suitable.